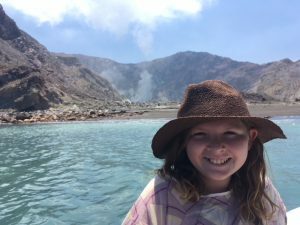 Recently, we have just been to somewhere called Whaakari or White Island. 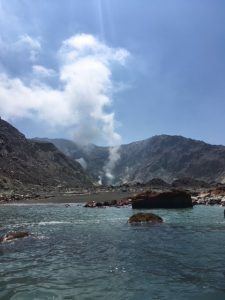 Whaakari is actually a volcano! Most of it is submerged under water. We weren’t allowed to land, but we looked at it from the dingy. Whaakari is actually a pretty dangerous place! There are ruins on the island of a sulfur plant that was hit by a lahar in 1914, killing all of the plant’s workers. We saw loads of smoke coming out but no lava or magma, but it does have an eruption every so often. A volcano is caused by a rupture in the earth’s crust, when it breaks or splits. They produce lava, volcanic ash and gas. There are around 33 active volcanoes in New Zealand and around 1,500 active volcanoes on earth. Isn’t that pretty awesome! By the way, I’ve just started doing watches! They are actually really fun and I’m really looking forward to progressing to night watches! Well, thanks for reading our blog! I’m sorry that I haven’t been writing much! Just having to much fun! 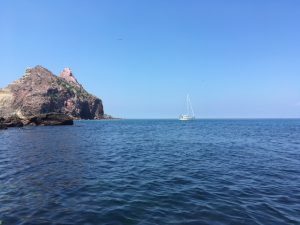 Recently, I have been taking my turn at helming (steering), going through narrow gaps between islands, anchoring and navigating through shallow channels (not to brag). Mum is the main person who steers, you know, berthing and stuff. Yesterday and the day before we were at a nice bay in Port Fitzroy called Smokehouse Bay. There are two baths, one inside and one outside, a shower, awesome rope swings and pizza oven. We had a pizza party with some other boats and Fired up the oven. It was the best Pizza I have ever tasted! 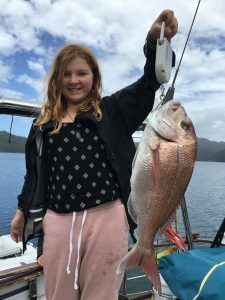 Also, not to brag, I caught a MASSIVE snapper that weighed 2.6 kg. He will probably last us two nights, including a sashimi éntree! Well, everything is going great here and I hope it is for everyone else as well! Ps. 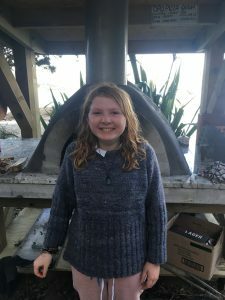 I recently went back to Carterton and stayed at my Grandparents for two weeks. It was really interesting seeing everybody again! Thank you for having me! 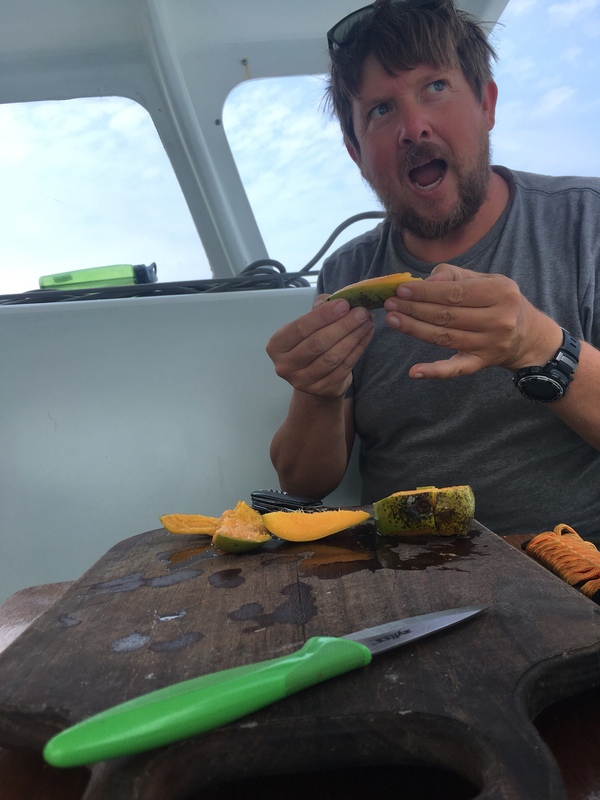 Something we’ve seen happen to more than half the boats we’ve met in Vanuatu is badly infected cuts and scratches. Usually starting with a tiny nick, an uncovered wound can degrade quickly into a large, swollen and infected mess. Coral cuts are often to blame, but any cut can deteriorate into a dangerous situation. Clean every cut with hydrogen peroxide or bleach as soon as possible. Cover every cut with a plaster. Nexcare waterproof are excellent for cruisers but a plaster that can breathe is better if you can keep it dry. As soon as it gets infected, clean, dress and monitor, if it continues to deteriorate immediately start a course of Flucoxacillin, a penicillin based antibiotic for bacterial skin infections. Always carry some Flucoxacillin onboard, you can buy it over the counter in the pharmacies in Port Vila or Luganville. Some Augmentin is probably good to carry too, but don’t use it unless you really need it. One day I noticed a small cut on my ankle, maybe getting out of the dinghy or scratched on a piece of rigging, it quickly scabbed over and I ignored it. Being on my ankle I knocked the top off it and it started bleeding again. I whacked a plaster on it and forgot about it until we were walking around the island of Vao. As we walked I noticed flies trying to land on the cut, the plaster had fallen off. I covered it again later but then in 24 hours a white pus lump appeared and the skin around was inflamed and painful. My leg quickly swelled and I showed it to our friends on Gonyonda. A nurse, Mariko was quick to identify a problem. She cleaned it up for me and we got some Flucoxacillin antibiotics to treat it. A week later it’s better, but I can see I’ll have a scar and I’m glad we got into it early. 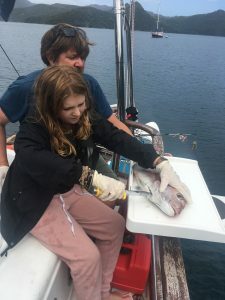 This is not uncommon, of the 4 kid boats we hangout with, every boat has had at least one crew member that has been on antibiotics for this kind of infection. 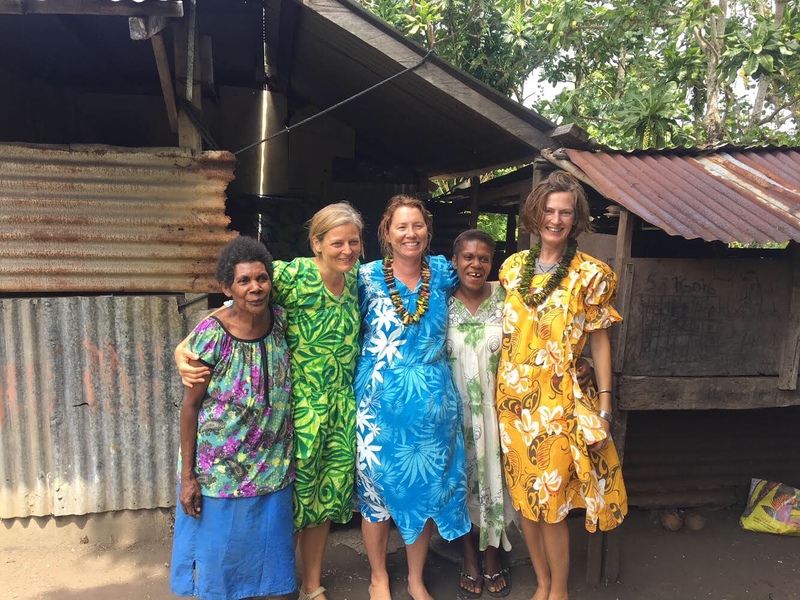 We arrived around a week ago in Port Resolution, Tanna, Vanuatu and we put up a yellow flag which means that we want to check in to the country (Vanuatu). A boat that we are now sailing with, called Gonyonda, arrived the day before us and had explored the village. 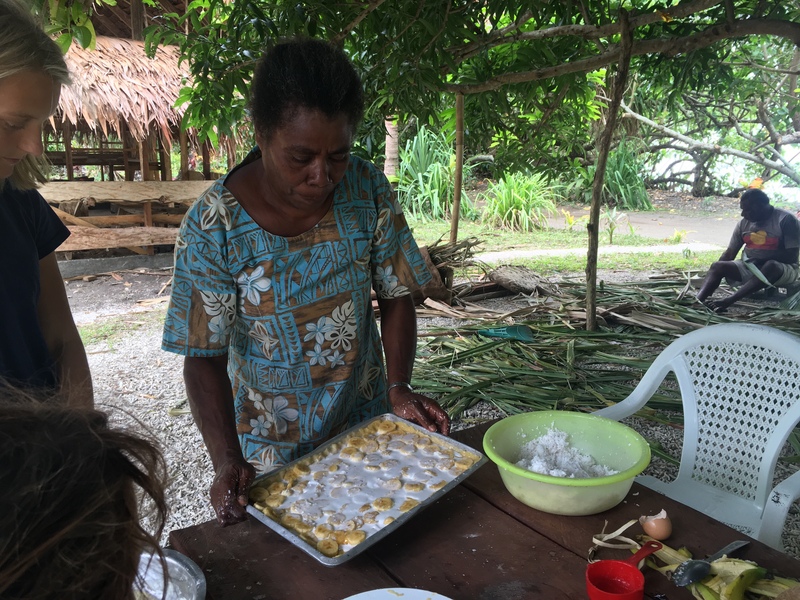 In Port Resolution, the place where we checked in, the people live off the land and don’t use very many artificial household appliances. Most of the houses have no running water and the only electricity comes from solar panels, the size of a square foot. 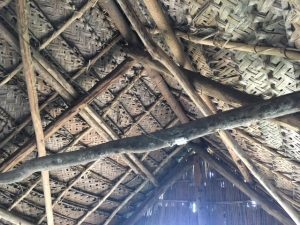 Their houses are made of straw, flax and wood including bamboo and the roots of the banyan tree. 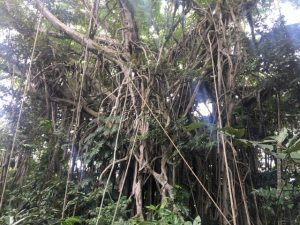 The banyan tree has lots of roots and villagers take roots and tie them to the ground so they grow straight and into poles so they can make their houses. 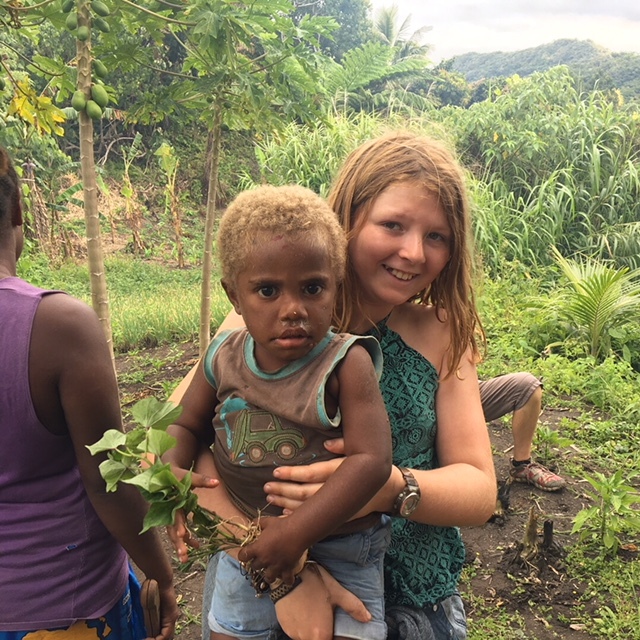 When we went for a tour of their village, Willie, Sheila, Sarah and Jack (some very nice villagers from Port Resolution) took us up the hill and we ate sugarcane, coconuts and corn and bananas, which were roasted over a fire that Jack made by rubbing a stick into a log and making smoke and embers. 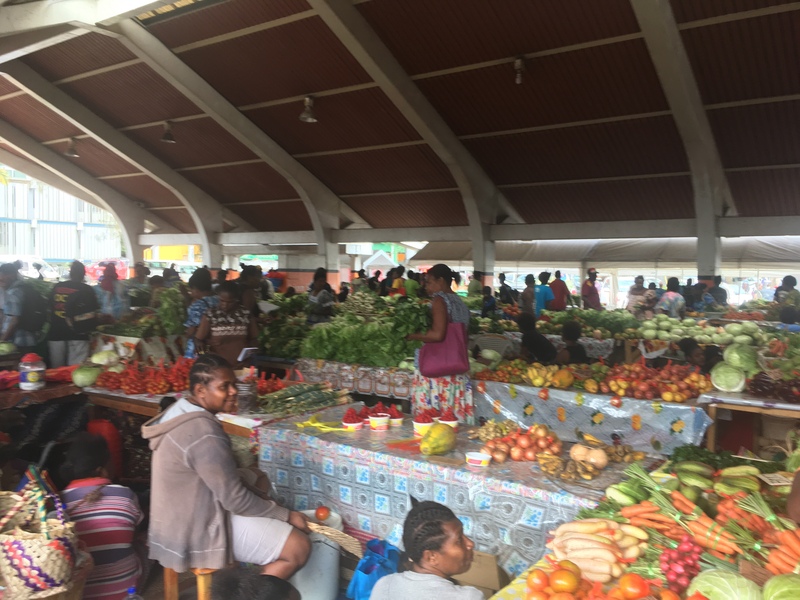 One of the things I really admire about Vanuatu, is that they have banned plastic bags, which is pretty cool! 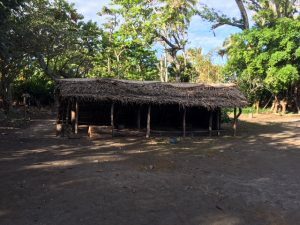 We went up a volcano which some of the locals believe houses a god called John Frum and they think that one day he will come out and give the people washing machines, dishwashers, clothes and furniture among many other things. We got up there in the back of a truck, which was very bumpy, especially considering we driving up dirt roads. 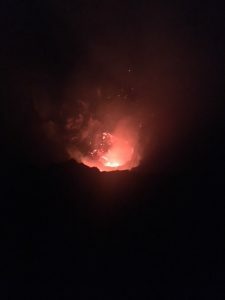 The volcano was magnificent. We were up there for a few hours and all through that time, I was freaking out and relaxed at the same time. Every five to fifteen minutes, it would erupt and we would be coated with volcanic dust. 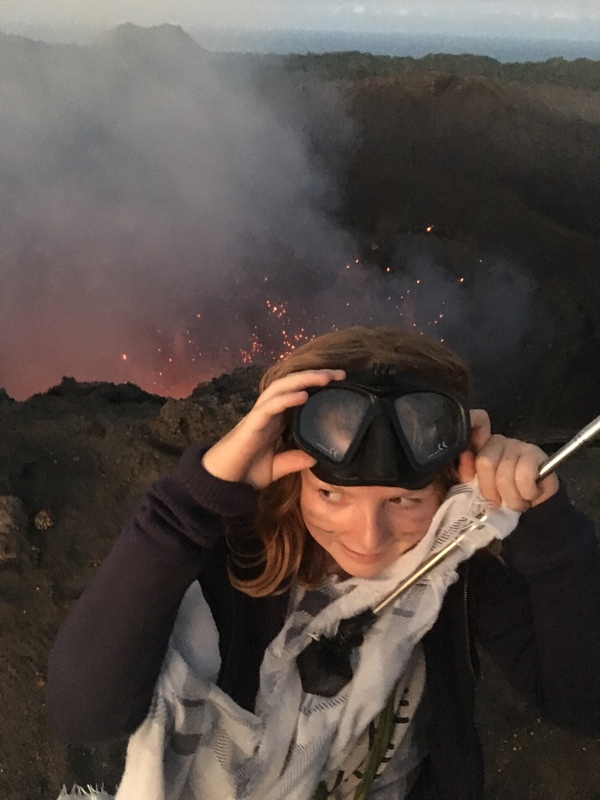 When it got dark, the eruptions were even more thrilling. Blobs of lava double the size of Dad would fly up and we would all step back and cover our heads. A few days later we went to a party with some Vanuatuan locals invited us to there restaurant (a house with a thatched roof, concrete floor, no walls on one half and a kitchen) and we had taro, fried rice, chilli stew, coconut rice and some chocolate cake that a kid called Freya from Gonyonda and I made. At the end, Freya and I were gifted choco each, which is a very nice fruit (or vegetable?) that they grow. 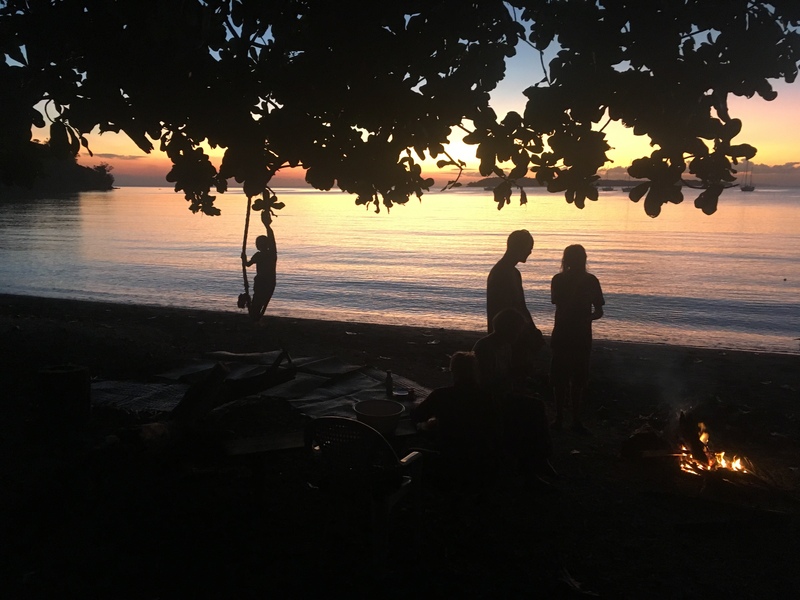 Yesterday, we left Tanna and sailed to an island called Erromango. On the way, our main sail ripped and we had to motor. We are probably going to fix it when we get to Port Villa. Well, that’s what’s been going on on Dog Star! Please leave a comment about how it is at home! The baby in this picture is called Sabai and she lives in the village with her family. She’s so cute! 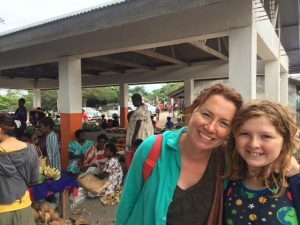 Mum and I at the market in Lenakel. 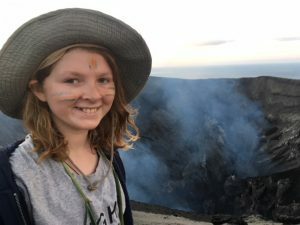 We went their on the back of a ute and it was very exciting, whizzing along the dirt roads, right next to an active volcano. Working on the boat with Dad! I put a through hull in the boat with Dad yesterday! Is was pretty awesome! But before I tell you how I did it, I’ll explain what a through hull is. A through hull is a hole in the boat that lets water go in and out of the boat. Don’t worry, most of them only let water go out, we’re not going to sink. We also use them to let the toilet waste go out and let salt water in to use as flushing water. First, we went to the boat-yard shop and bought something called a ball valve and a through hull or skin fitting. A ball valve is a valve that has ball with a hole inside of it. The handle turns the the ball inside. So, for instance, if I turned the handle 45 degrees the valve would be half open, so it lets some water through but not much. If I turned it another 45 degrees (which adds up to 90 degrees), then it would be fully open. If I turned it back 90 degrees, the valve would be closed and nothing could go in or out. The ball valve can only let water go in and out, not just one way, which sometimes isn’t the best to use for some through hulls. A through hull or skin fitting is a fairly simple piece of technology. At the top there is a flat piece of metal or plastic that makes sure that it doesn’t fall off. The same is used for the nut on the other side. The only thing different from screws and through hulls, is that through hulls have a hole on both sides. First, we drilled a hole with a 35 mm diameter with a special type of drill part called a hole saw. We had to drill the hole from one side to about half way then drill from the other side until it met the first drill hole. If we had done it from one side only, it would have exploded the paint work in that area when it reached the other side. Then Dad got something called an angle grinder to sand the paint off where we had drilled the hole, so we could stick the through hull in with epoxy. We did that because it wouldn’t stick to paint. Soon, Dad and I were wearing gloves and masks and mixing slow hardener (because we are in a warm climate), epoxy resin and colloidal silica (to thicken it) to make epoxy. We mixed the epoxy, then used it to stick the through hull in the hole that we had drilled earlier. 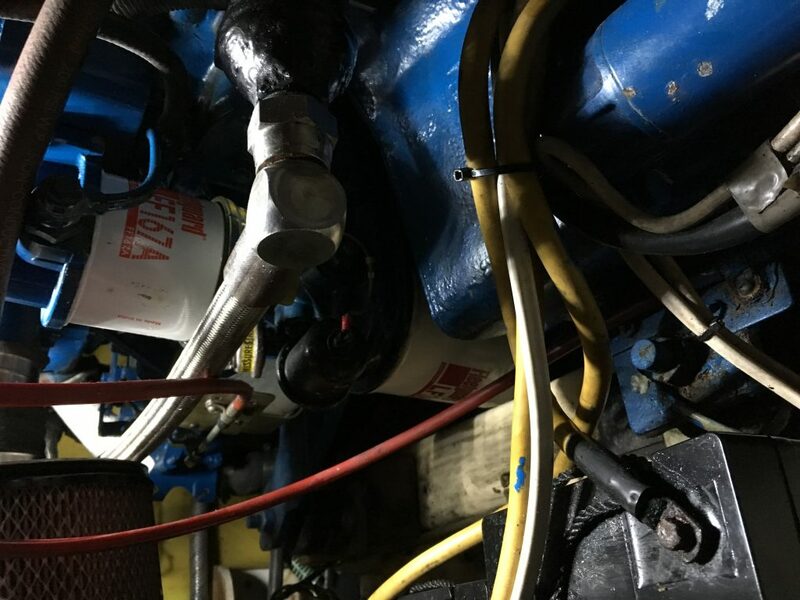 The next day, we screwed the ball valve in and now we have a perfect working through hull with a strong, reliable valve for our bilge pump! These are jellyfish that can cause severe to very severe envenomation. Captures of these jellyfish are ongoing, for precise identification purposes. At this point, it appears to be “Irukandji” jellyfish, the Cubozoa class, commonly referred to as “cubo jellyfish” because of their box shape. 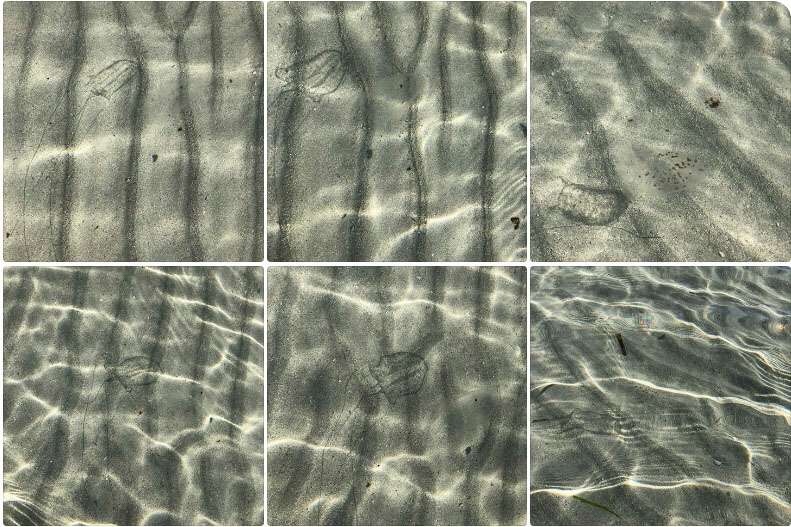 Testimonies of bathers also bitten have reported these jellyfish in a maritime geographical zone from the lagoon of Bourail to that of the island Amédée. – Do not bathe in the indicated areas. – Do not handle a jellyfish, even stranded or dead. 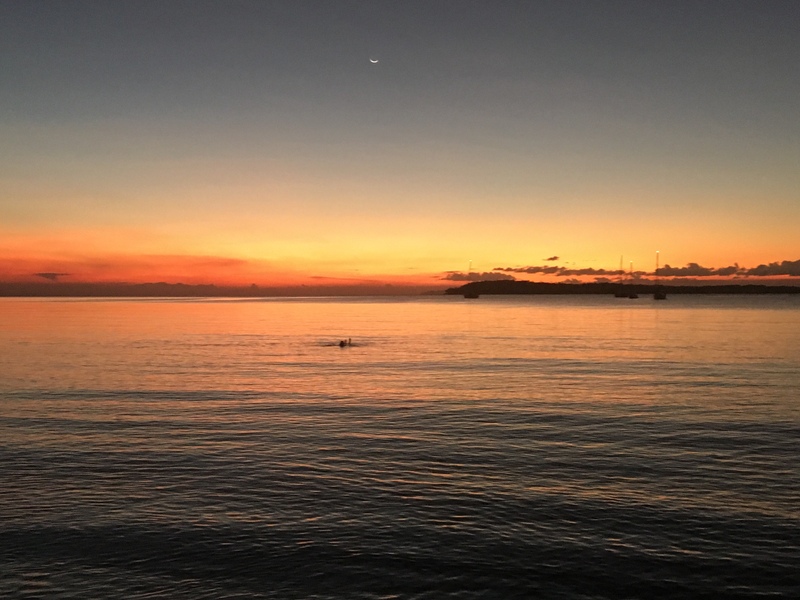 – Get out of the water as soon as possible. – Thoroughly rinse with vinegar as soon as possible the wound and the tentacles (if there are any) to inactivate the venom. – After applying the vinegar, remove the tentacles gently, using tweezers, and not with bare hands. – Dry and warm up the person quickly. – Take a pain treatment if necessary. – Request medical advice urgently, or call 15. – Never rinse lesions or tentacles with seawater, fresh water, urine, lemon, alcohol, soda, shaving foam, etc. – Do not scratch the tentacles (the tension of the tentacles can cause a discharge of venom). On Friday Dad and I went for a walk along the beach and had a surprise waiting for us. 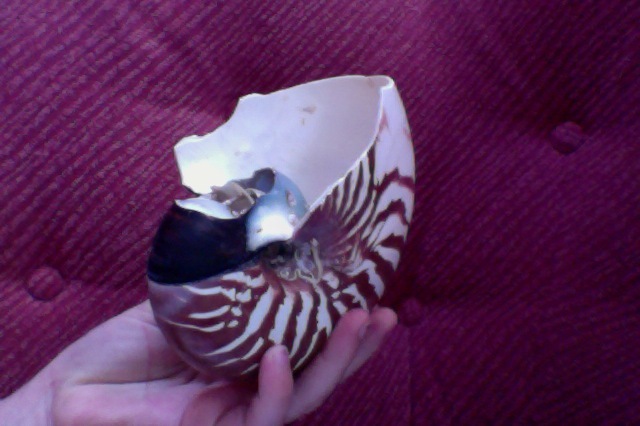 Two Nautilus shells! We took them back to the boat and showed them to Mum. These are photos of one of the the shells. Nautiluses are animals that have been here for over 500,000,000 (five hundred million) years, a long time before humans arrived, which was 1,500,000 (one million and five hundred thousand) years ago. Unlike humans and other living organisms, they haven’t changed or evolved since they arrived. The word “nautilus” comes from the Latin form of Ancient Greek word “vaut”. Nautiluses are molluscs from the cephalopod family, Nautilidae. They have a parrot like beak for ripping apart crustaceans. Nautiluses have blue blood, when it is oxygenated, unlike ours, which is red because of our haemoglobin cells. They have a large shell which has a hole the shape of a bucket were the body and head of the Nautilus is kept. 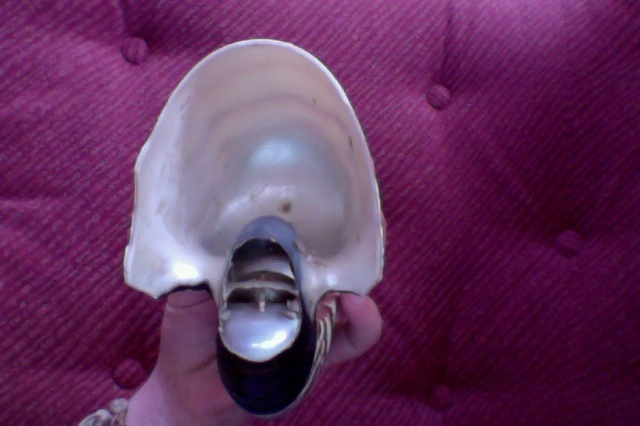 The actual shell is lined with mother-of-pearl (oyster) and is pressure resistant up to 800 meters below sea level! 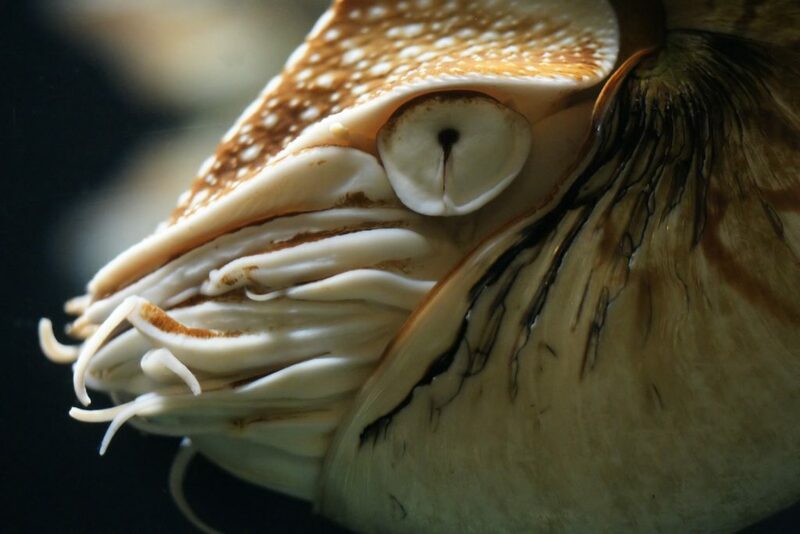 Did you know that nautilus’s have eyes? Weird right? They use them to see if a predator is coming and how well their camouflage is working. Nautiluses also have tentacles which they use for feeling and grabbing their prey. Nautiluses can live up to twenty years old, fifteen in captivity. They feed mainly on lobsters, hermit crabs and carrion (dead animals) of any kind. Thanks for reading and please feel free to comment down below! We have arrived in New Caledonia! Woohoo! Yesterday we decided to go to an island called Ilot Maitre that was surrounded by coral. We all went snorkelling and swam around the coral. I made a short clip of what it was like and here it is! Four years ago I’d never been on a sailboat. In all honesty I thought sailing was for rich people who wore bad clothing. 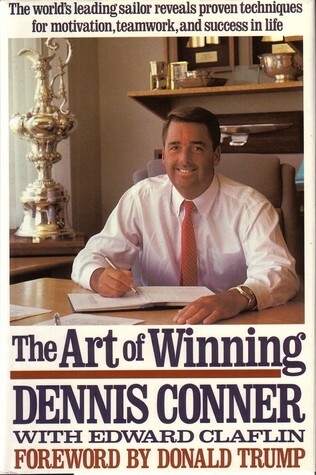 My childhood memories of the America’s Cup and Dennis Conner didn’t help either. In a few days we are sailing from New Zealand to New Caledonia in our boat. Most people I know think we’re nuts for doing this but I’m feeling excited and confident. I can’t wait to go. This is how I went from knowing nothing about sailing to taking our own boat offshore. Robin had sailed dinghies as a teenager and he was keen to sail again. He did the Wellington Learn to Sail course and I hoped he’d get it out of his system. 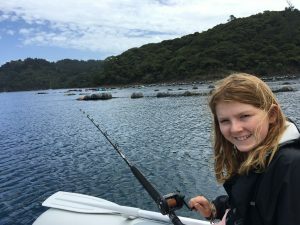 He didn’t, and instead he talked me into a holiday in the Bay of Islands where there is a fantastic sailing school who also charter boats – you are taught to sail, then given the boat to sail by yourselves. Before we went I didn’t expect that after the three instruction days we would actually sail the boat alone, instead I was secretly plotting to get off the boat and to the Duke of Marlborough. I was still hopeful that if I went along with Robin’s sailing interest he would get over it. 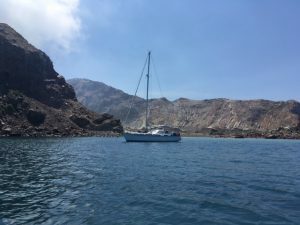 So in October 2014, Ian, our instructor, spent three days taking me from someone who didn’t know how to get onto a boat, to someone who could confidently head off into the bay with only Robin for help – after those three days of instruction we could find our way around the islands, anchor overnight, and avoid the rocks. Looking back I’m amazed at Ian’s patience. I didn’t see him wince once. No eye rolls either. We went back to Great Escape, the sailing school/charter company, in February 2015 and chartered one of their Raven 31 boats (no instruction this time!) . Iris loved it, I could see she was totally at home on a boat. It was a great family time, lots of jumping into the sea. I was starting to warm up to this. In January 2016 we bought Sojournie, a Lotus 9.2, in Nelson. We made lots of mistakes but none of them seemed to end in complete disaster. 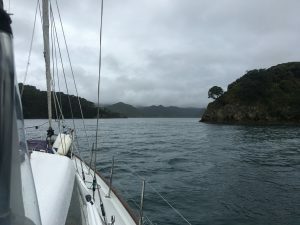 We sailed her in the Marlborough Sounds and over the Cook Strait a few times. 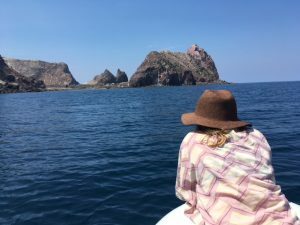 I couldn’t believe how deserted a lot of the bays in the sounds were – we were often alone in paradise and I didn’t know why more people aren’t out there on boats. Money is the obvious issue but Sojournie cost less than a new family-sized car (let’s not discuss the maintenance budget). I’m good with driving an older car so we can afford a boat but I know we’re lucky and that financially a lot of people can’t afford a boat or a new car. That year we started talking seriously about buying a bigger boat that was capable going offshore. There were lots of reasons for this – Robin had always had the desire to do it, Iris was a good age for it (not a teenager yet but old enough to be sensible), I was getting pretty burnt out as a midwife (best job in the world but I found the 24/7 oncall was too hard to sustain). I like to think Robin got me in a weak moment but in truth I was ready to commit to doing something adventurous. I liked how mad it seemed. In November 2016 we sold Sojournie, mortgaged the hell out of the house, and bought Impulse II (we changed the name to Dog Star), another Alan Wright design but this time 42 feet and designed to be capable of sailing an ocean. It’s a very safe and well built boat but most importantly it has a *hot shower*. Although we’d been sailing for a few years, before we went offshore we wanted to get more skills, so last year Robin and I did the RYA Coastal Skipper course at Sail Nelson. Iris came with us and she did her Level 1, Competent Crew. I was really proud of how well she went on this course and how good our instructor was with a child. She knows more knots that I do now. I really benefited from the boat handling part of this course. Prior to this I’d been struggling with berthing the boat (read: I was terrified of it, avoided doing it at all costs and yelled a lot when doing it) and after this course I became the person who usually berths our boat. I feel quite pleased with myself when I do it, but I’m still relieved when (if) we don’t hit anything. 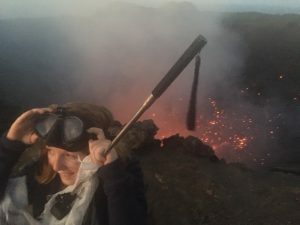 It’s very easy for me to to sit back and let Robin do the things that seem out of my comfort zone – some of these skills are intimidating – and it’s been important to me not to do this (too much). We also wanted some experience sailing offshore. 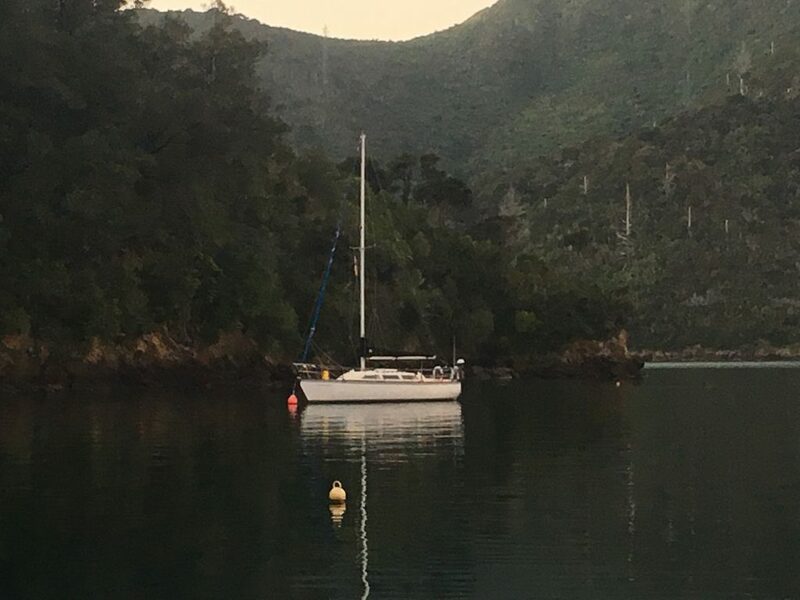 Kim, a boatbuilder who had surveyed Dog Star before we bought her, was delivering a 54ft Moody to/from Noumea and was generous enough to take us as crew – Robin went in May, Auckland-Noumea, and I went in September, Noumea-Auckland. Kim and Craig, the other crew member, have been sailing many years and have both done the Sydney-Hobart race. I knew I was in good hands and I felt relaxed enough to spend the passage focused on the task at hand (talking Kim into shaving off his moustache). 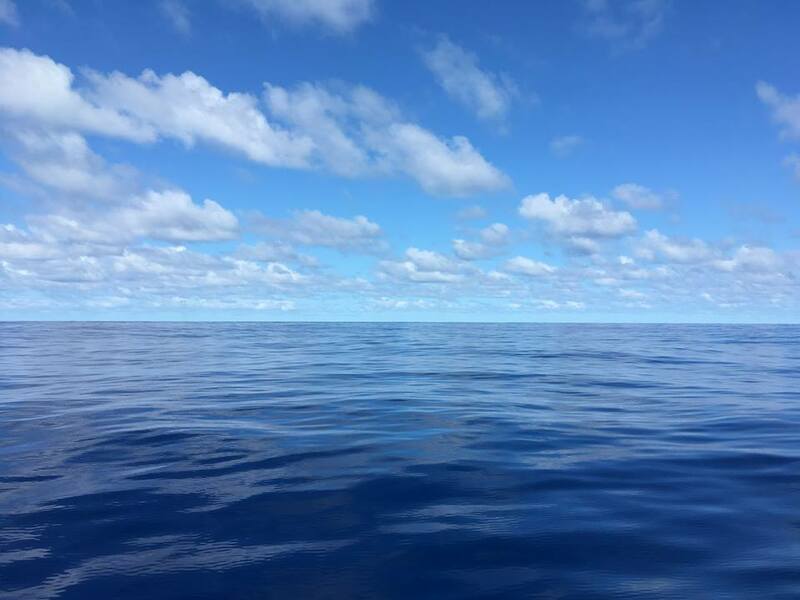 In all honesty it was an unusually calm passage and may have lulled me into a false sense of security about the ease of offshore passages. I’m still holding onto the idea that getting out of Wellington harbour is supposed to be the hardest part. A lot of last year and the first few months of this year were spent working on Dog Star. 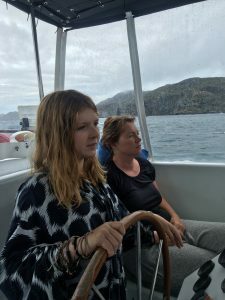 We’ve been lucky to have people like Kim, the boatbuilder, and Travis, diesel engineer, to help us, as well as Craig to give us advice and encouragement and generally be enthusiastic about the whole idea of going offshore. 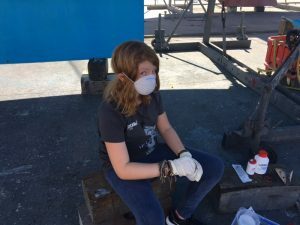 The boat maintenance was another area I found intimidating, and although my knowledge and skill level is nowhere near Robin’s and I don’t know what anything is called, I get into the engine bay and go up the mast. 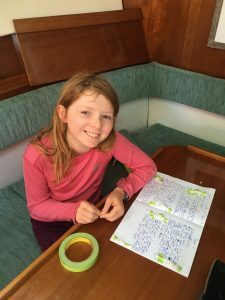 In truth, the hardest part of all this wasn’t learning to sail but figuring out how to leave our life in Carterton – saying goodbye to family and friends, renting out our house, helping at the last birth. We’re going to get so much good family time together that I think it’s all worth it. So in less than four years, it’s all happening!